This year I have two, count them two, headed off to school. Sue will be joining Caitlyn at her elementary school. Unfortunately Sue is not yet exctied. She is going to do so well. Really. Thankfully we have lots of hand-me-downs for both of the girls, so we don’t have to do a lot of school shopping–clothing wise, but wow, the actual school supply list is crazy. At first I was just frustrated with all I had to buy, but lately I have gotten sad about it. Sad that we are purchasing things that used to be provided. Sad that things have gotten so tight financially for the classes that they need us to buy the wipes to clean the tables. Sad that if we didn’t buy these things then the teacher would have to. It is just sad. What thing has recently struck you as sad? What just pulls at your heart? As I mentioned, our oldest, Caitlyn started kindergarten this year. That has brought lots of new things. This weekend it brought…homework. The teacher provided brown and green construction paper for us to make a family tree. Daddy commented, when he saw the information for the project, Caitlyn, you have a big family, your tree will be very full. Our girls have lots of aunts and uncles and cousins. Lots. But we had limited room. The base of the tree was tracing her arm from elbow, up and around her open fingers to make the limbs. We did that, then I sent her out to get a leaf we could use to trace to make ours. I think the ones we made look like oversized sperm, but the jury was split on this. I had Caitlyn help me with tracing and cutting. She did not do all of it, but she did at least half. I wrote the family names on the leaves. (I only went to the aunt and uncle level) She did all the gluing, and loved it. 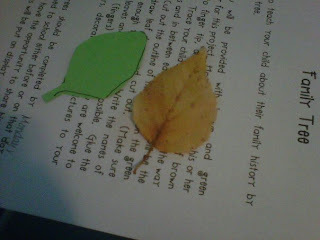 And we talked about who was on each leaf, as she will have to present about it at school this week. The whole time I stressed. Was I having her do enough? Too much? Should we make it fancier? I was, sadly, not clear in what I was trying to communicate. My doubts and struggles are not with her work. I know she definitely at, if not above, her grade level in her arts and crafts skills. My concern was with me. Was I having her do enought, too much? Would other parents do more of the work so she would feel like hers was not as good? Honestly, I still don’t know. Hubby had some questions about it today when he saw it. He’s concerned she might not be able to talk about it. This could completely stress me out. I want to help Caitlyn get off on the right foot. I want to do this parent-of-a-school-age child gig, perfectly, but I don’t know what that is, so we will all have to learn together. And in the learning, we will Just Be Enough. 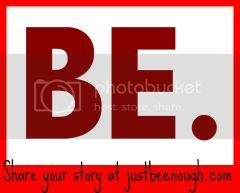 I am linking this post with Just Be Enough.